The following 1873 account of stereoplating and electroplating details the processes by which plates were made and from which books like Lucile were printed after 1860, when Lucile was first published, until the time Lucile began to fade from the market after 1910. Electroplating almost entirely replaced stereoplating in the 1860s and 1870s. For a separate account of American bookmaking from this same source see bookmaking. STEREOTYPE PLATES. - THEIR ADYANTAGES. - SAVING WEAR OF TYPE. - JOHN MULLER OF LEYDEN . - VAN DER MEY. - WILLIAM GED, OF EDINBURGH. - THE DIDOTS, OF PARIS . - EARL STANHOPE'S STEREOTYPE PRESS. - FIRST STEREOTYPING IN THE UNITED STATES. - DUPLICATE FORMS. - PROCESS OF STEREOTYPING. - MATERIALS USED. - TRIMMMING AND PLANING THE PLATES. - THE PAPIER-MACHE PROCESS. - NEWSPAPER STEREOTYPES. - THEIR UTILITY. - ELEOTROTYPING. - CHEMICAL AND MECHANICAL PROCESS. - THE MOULDS. - THE GALVANIC BATTERY. - HOW COPPER FAC-SIMILES OF TYPE ARE OBTAINED. - COPPER-FACED TYPE AN IMPORTANT ADJUNCT TO THE ART OF PRINTING. A STEREOTYPE plate is a fac-simile in type metal of a page of movable type. Its design is to avoid the expense of keeping in type works for which there is a constant demand; to avoid the necessity of recomposition; to reduce the founts of type in the composing room; and sometimes to print copies of the same work on two or more presses at the same time, or to simultaneously issue a work in two or more different localities. To save the wear of type on the press; and to permit the use of the same type, over and over, in the composition of the successive pages of a book, early suggested stereotyping. As with many other discoveries, there are several claimants for the honor of this invention. John Muller, of Leyden, stereotyped pages in 1690. A few years later, Van der Mey, of the same city, soldered the bottoms of type together, making them into solid pages. William Ged, of Edinburgh , is credited with the modern mode of stereotyping, which releases the type for re-composition. William Ged, who was born in Edinburgh in 1690, was not a printer by trade, but a goldsmith, and his attention was first turned stereotyping in 1725. At that time all the type used in Scotland was cast in London, and it occurred to Ged that a great saving might be effected if solid pages could be cast which would release the type for re-composition. He borrowed a page of type and began his experiments. In two years he succeeded in making perfect plates; but he had to contend with the prejudices of printers, who fancied that their craft would be ruined by the new process, and, as has been the case with too many inventors, innumerable obstacles and difficulties nearly ruined poor Ged. He succeeded, however, in making complete plates for an edition of Sallust, printed in Edinburgh in 1736. After his death the art was nearly lost sight of till it was revived in Paris in 1795. 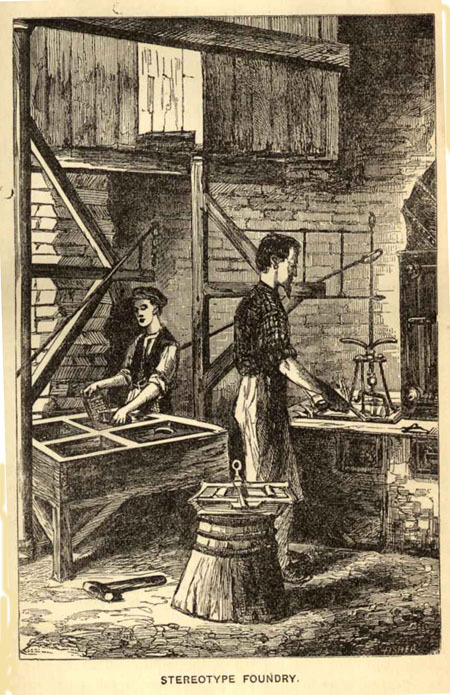 The Didots, of Paris, made many important improvements in the art, and Earl Stanhope, of England , invented a most valuable press for stereotype printing. The art was introduced into the United States in 1813, and soon afterwards stereotyping establishments were opened in New York, Boston, Philadelphia, and other cities. Nearly all the books now published are stereotyped or electro­typed, publishers generally thinking that if a book is worth printing it is worth putting into plates. The plan is also adopted in the case of many magazines and periodicals, since it enables the publishers, by duplicating plates, to run the same pages on two or more, presses at once, and, by preserving the plates, to republish particular numbers, or to reproduce an entire series, if there should be a demand for the same. The entire volumes of Punch, up to a certain year, have been republished. The art of stereotyping is invaluable, not only to publishers, but to the general public, in enabling a wider diffusion and cheapening the cost of books and periodicals. When a work is stereotyped or electrotyped, the spaces, "quads," and, leads used in composition are of the same height as the stem of the type. The mould for stereotyping requires the finest plaster of Paris, which is specially prepared, is mixed to the consistency of cream, and is poured over the face of the type, which have been previously oiled to prevent the plaster from adhering. The plaster soon sets, and the mould is raised from the type, and is hardened in a heated oven. It is then put face down­ward on a plate of iron in a cast iron pan, or cover, and is immersed in melted type metal, which runs into the spaces left in the cover, and fills every portion of the mould. This dipping process is repeated so as to allow the gradual and equal contraction of the metal. The result is a stereotype page, which may need some work with the picker and graver to remove imperfections. The edges are then trimmed in a machine; in another machine the back of the plate is shaved or planed to insure the requisite thickness and perfect level; and the plates (if they are cuts, but not generally for letter-press) are screwed upon blocks of wood which bring them to the same height of ordinary type. Corrections of a word, or a line, or more, in a page, can be made by cutting out the imperfect part and inserting ordinary type, which are neatly soldered in. Moulds are rapidly made for newspaper stereotypes by what is called the paper process. A newspaper page of type for a cylinder press is in a curved form, in what is known as a "turtle." Instead of plaster of Paris for a mould, moistened sheets of soft paper, pasted together, are laid over the page of type, and are beaten down with a brush till a perfect impression is taken. The mould is dried and hardened, and by pouring in melted metal one or more forms can be made to be printed from. This process is now pursued in several of the larger newspaper offices. The advantages are, first, saving the wear of type, which are used only composition, and not for printing from; and next, furnishing forms for two or more presses, and thus getting out the entire edition of the paper in the least possible space of time. This invention enables journals to delay the hour of going to press to the latest moment, thus keeping the columns open for the latest news, and yet permitting the publication at an early hour in the morning for distribution and for the mails. The edition printed, the plates may be re-melted, to be run into the moulds for the next day's issue. Electrotyping is now much more common than stereotyping by the process described above. It is a combined chemical and mechanical operation, the processes of which are as follows: The mould is made of pure wax, upon which the page of type is impressed. The mould is then covered with a coat of fine plumbago dust, which is evenly distributed by brushes in a machine, thus giving a conducting metallic medium for the electric current, which is further strengthened by a wash of sulphate of copper over which iron filings are dusted. The result is a thin film of copper coating the entire surface and hastening the subsequent deposit of copper when the mould is in the battery. The mould is now washed, connecting ribbons of copper are attached, and it is suspended from a metal rod in the trough containing a solution of acidulated sulphate of copper. Any number of moulds, according to the dimensions of the trough, may be put in at the same time. Copper plates are suspended in the solution, facing, but not touching, the moulds. The trough in which the electric current is generated contains sulphuric acid, and is isolated from the trough which holds the moulds. The rods which suspend the moulds in the solution are now connected by wires with the zinc plate in the battery, while the copper plates are similarly connected with the platinum in the battery, and the circuit is completed. Decomposition now begins, and the copper is rapidly and evenly deposited on the face of the mould. The moulds are left in the trough generally over night, and in the course of ten or twelve hours copper shells are formed on the moulds, giving fac-similes of the pages in type. The inside of the shells is covered with a coating of chloride of zinc, laid on with a brush. Over this is laid a sheet of alloyed foil, and the shell is then " backed up" with inferior type metal to give it solidity and the requisite thickness. This backing is done by pouring in the metal, or by dipping the shell in metal; the face is then laid down on a perfectly level iron plate resting on an iron frame, which must also stand perfectly level, and the superfluous type metal is scraped off. The subsequent processes of trimming the sides and planing the backs by machinery are the same as those described in stereo­typing. Corrections can also be made by cutting out and inserting, as in the ordinary stereotype plates. By means of the galvanic battery type can be copper-faced by presenting only the face of the type to the solution of sulphate of copper in the trough, and establishing the current as in electro­typing on moulds. Type thus faced are very durable, and will wear three or four times longer than common type. For some work on heavy calendered paper, stereotypes made by the first process described are sometimes preferred; but for the great mass of book-work, and especially for cuts, electrotypes are superior. The invention is comparatively recent, though experiments in electro-plating were made in Europe , with more or less success, from 1801 to 1840, and it is a most important adjunct to the art of printing. From The Great Industries of the United States: Being an Historical Summary of the Origin, Growth, and Perfection of the Chief Industrial Arts of This Country. By Horace Greeley, Leon Case, Edward Howland, John B. Gough, Philip Ripley, F. B. Perkins, J. B. Lyman, Albert Brisbane, Rev. E. E. Hall, and Other Eminent Writers Upon Political and Social Economy, Mechanics, Manufactures, Etc., Etc. With over 500 illustrations. Hartford : J.B. Burr & Hyde; Chicago and Cincinnati: J. B. Burr, Hyde & Co, 1873, p174-180.